Last week I went on trekking with an organization named Durgasakha. First thing first – thank you to my friends Abhishek Ranjan Jha and Santosh Jagtap to pull me and registering me for the same and thanks to the Durgasakha team. It was a great experience and a good outing after long work hours and weeks. Beyond a break from work, why I enjoyed this trek is also the reason of why I am writing this blog. I liked this organization, thanks to Abhi, Subodh and Nene Kaka who informed about the mission of this organization during the trek. Durgasakha is a Hindi/Mararthi word which means – Friends of forts. The organization came into existence as a group who were trekking enthusiasts. Slowly these guys realized that few group visit these forts and litter here and there. So, one thought – to keep forts clean (source of water and temples on the fort) whenever they visit there – came in mind. Plantation and finding history of the place etc. Well, initially any person may think that it is a good thought and perhaps every trekking group would want to do that. This organization goes beyond it. This group took another initiative, to help underprivileged yet bright kids, question was how? This initial thought was materialized on two levels, one to distribute used cloths etc – I will come on the ETC in some time – to the interior areas of Maharashtra. The ETC part was – people are moving from CRT TVs to LED/LCD TVs so if those old TVs can be distributed to schools of the interior areas with educational CD and CD players that would help learning of these kids. A fact was, this group – currently – does not take any cash donations in general from anyone, any profit from the trekking events go to sustaining these activities of helping the villagers. Is not it interesting? These people are no ‘corporate bigwig’, these guys are like many of us, who are working in Mumbai struggling in trains on daily basis, for example. 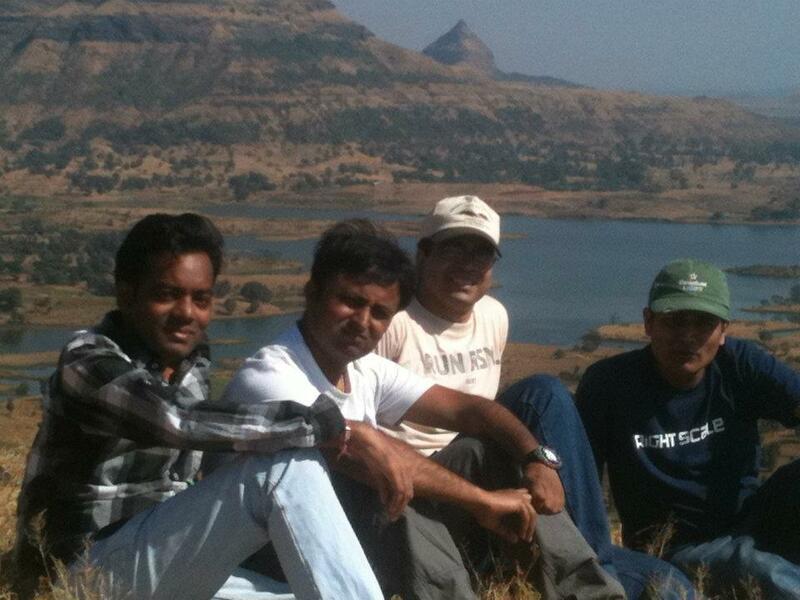 One other friend of mine – Nitin Chandorkar – was with me on the trek. He suggested “I am of the opinion that we should not just give them facilities but also make them self reliant” (give a man a fish and you feed him for a day, you teach him how to fish and you feed him for life). A very good thought, to our surprise the group – Durgasakha – has already started and done that too. Few Namkins we took on trek were from similar organization they are trying to nurture. After this trek I was thinking to write about this experience. I was wondering one does not need to be politician or very rich to do something for the society. What is needed is – preparation of heart and mind or desire to do something. I remember few lines of a Hindi Song – …’Mushkil nahi hai kuchh bhi, agar thhan lijiye’ मुश्किल नहीं है कुछ भी अगर ठान लीजिये. Nothing is difficult if you are committed! I am very happy that you have found this group and have decided to participate in their activities. Yes, nothing is impossible. I am part of http://www.iimpact.net/ though not yet physically involved. Once I am back on my feet, I will be doing more field related work for them. It is a good organization, they are organizing another trek on 3-4th Feb, premise remains same – trekking, sharing knowledge of Indian History and Helping society. hi pravin … thank god u are again connected with people and nature …. keep it up … visit as many places on weekend and help people … only working in AC office will not solved purpose of life we need to explore … trecking is good option .. i am sure u agree ….